The practice was founded in 2005, since then the business has grown significantly and in August 2013 the team moved into a purpose built surgical facility, ideally located 1 mile off the M90, near Kinross. The move provided the chance to offer the complete service to our clients, offering continuity and the high level of service they know to expect. We are now able to extend this service to referring veterinary practices who share in our ethos of wanting the same high quality service and care for their own clients and professional and timely communication to ensure that they are kept updated at all times. We know how important a good referral service is. We passionately believe that it is essential for both the Veterinary Surgeon referring the case and the owner of the horse to get continuity of care and receive an exceptional level of service. 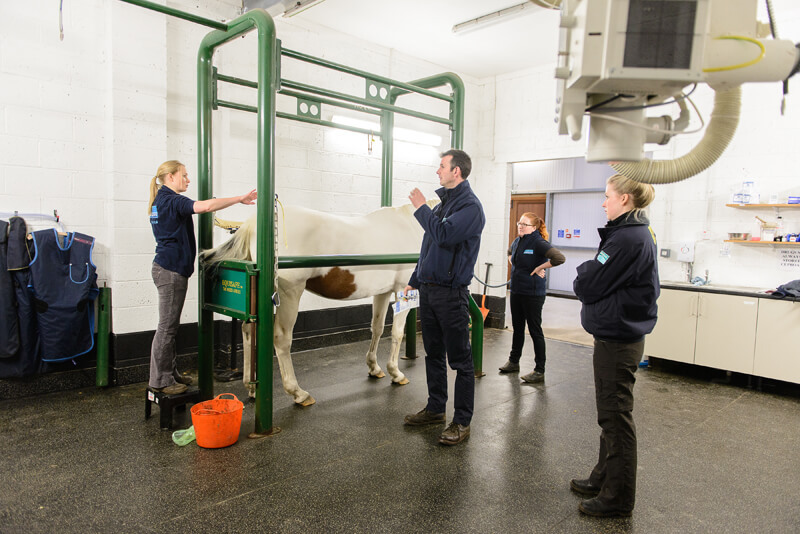 Our Vets will always liaise directly with the referring Veterinary Surgeon before and on the day of any examination or surgery, as well as keeping you informed both during the horses stay and at point of discharge. A written report will then follow within 24-48 hours. Clients can also expect to receive a high level of service and will be kept fully informed and updated throughout their horses stay. We understand that this can be an upsetting time for clients, and our compassionate team will ensure that this is as stress free as possible. Our team understand that effective communication is essential to allow a smooth transition when the case is handed back to the referring Veterinary Surgeon. We believe in working with you, we are delighted to provide any further advice or assistance you want once the client is back under the care of your Veterinary Practice. The purpose built padded knock-down box has a swinging crush door for safer anesthetic inductions as well as a rope recovery system which is invaluable in making the recovery from anesthesia as safe as we can. 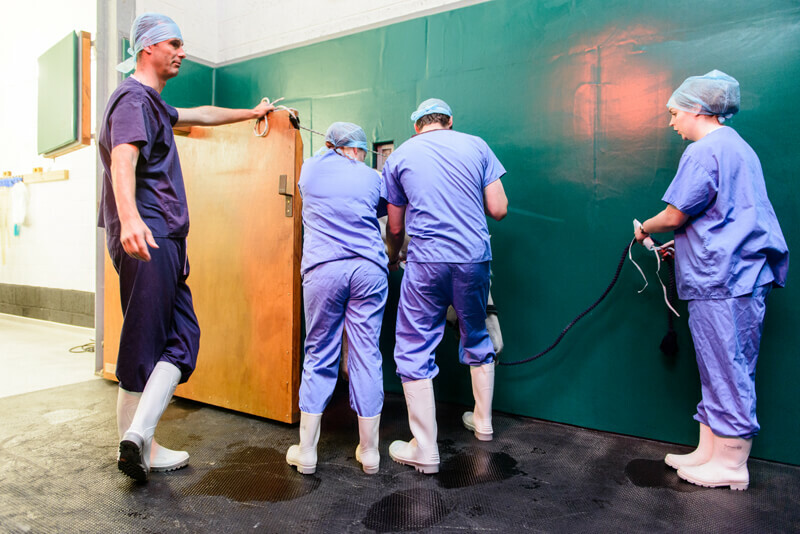 The operating theatre as a specialized Haico Telgte table, an equine specific anaesthetic circuit and ventilator along with all the monitoring equipment our fully trained veterinary anaesthetist use to reduce the risks associated with anaesthesia in horses. Much more surgery is performed under standing sedation and the Clinic also has excellent facilities for this, with a sealed non-slip rubberized floor in the exam rooms, and stocks and a gantry mounted x-ray generator in the main examination room. We currently have 5 indoor Lodden stables and 4 outside stables. The facilities enable us to provide inpatient care and a medical and surgical service for both routine and emergency cases 24 hours a day. In addition the clinic now allows for a complete lameness examination as we have a combination of fenced soft and hard lunge circles, an indoor trot-up and a loading ramp – all managed by nursing staff who are excellent at compassionately and safely handling all sizes and types of horses. The practice prioritizes investing in new technology, equipment and training ensuring our team can provide a Gold Standard specialist equine service. We also work with visiting Specialist Geoff Lane MRCVS to provide wind surgery, including Tie-Back, Tie-Forward, and Hobdays. Should you require any other procedure or service, please do not hesitate to call to discuss your cases with us. Since qualifying in 1997, Hugh has always worked in Equine Practices. These have all had surgical and in-patient facilities and so much of his time has been spent developing this interest. This has included attending specialist surgery courses in Germany, Switzerland and the USA as well as at home in the UK. Hugh then pursued this further and was amongst the first group in the UK to study for and receive the Advanced Certificate in Equine Orthopaedic Surgery. 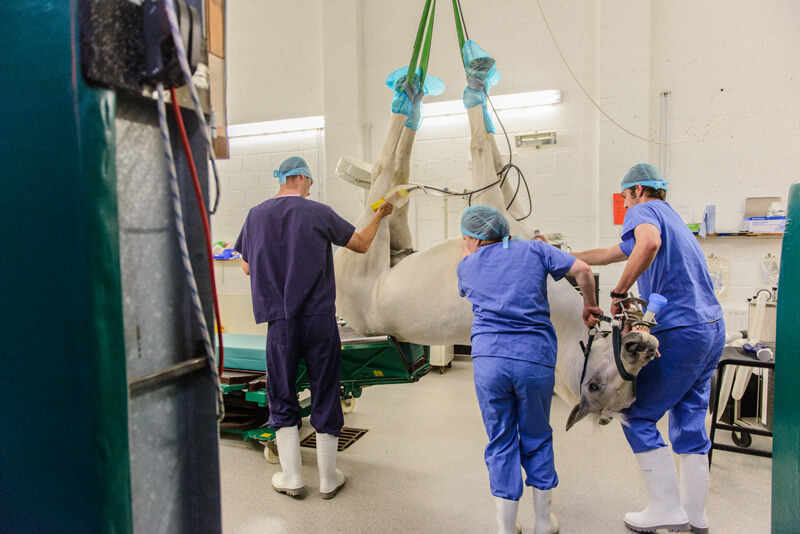 Hugh is recognised by the RCVS as an Advanced Practitioner in Equine Surgery – Orthopaedics, meaning that referring vets can be assured Hugh will continue to be up to date in this field with the extra CPD required above the RCVS minimum requirement. He is currently studying for his second Certificate in Equine Imaging. Hugh is supported by a team of experienced, dedicated equine only Vets and Nurses.